ePosters - Is this all Just One Big Hole in the Head? The Role of Neuroradiology In Guiding Biopsy. 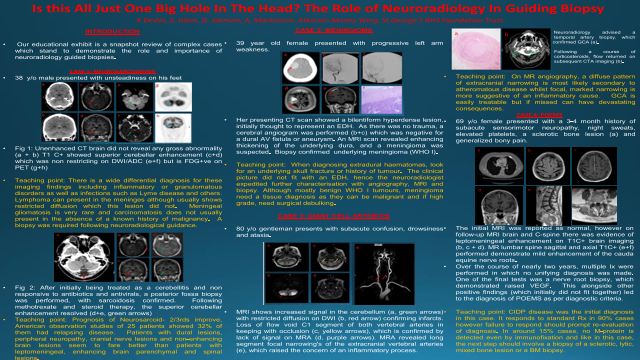 Poster Title: Is this all Just One Big Hole in the Head? The Role of Neuroradiology In Guiding Biopsy. Abstract: Our educational exhibit is a snapshot review of four interesting and complex cases which stand to demonstrate the role and importance of neuroradiology guided biopsies. The importance of neuroradiology in guiding biopsies is to help establish a diagnosis in rare conditions, but also in common conditions with unusual presentations. A correlation can be made between the clinical, radiological and pathological findings to establish the diagnosis and ultimately aid effective and appropriate treatment and follow-up for the patient involved. Our review focuses on four patients who presented at a single tertiary centre between 2011 and 2018. The cases encompass a wide range of interesting diagnoses including neurosarcoidosis, POEMS (polyneuropathy, organomegaly, endocrinopathy, monoclonal gammopathy and skin changes), giant cell arteritis and meningioma. Each case will commence with a brief description of the presenting symptoms followed by a series of selected and labelled images. We will discuss the main imaging findings alongside the differentials which led the clinical team on at the time to proceed to biopsy. The educational take home points mainly focus on the image findings and will be summarised at the end of each case.